Anaheim Ducks Autograph Series Hockey Puck NHL Desk Pen Holder. Has an authentic Sher-Wood autograph style puck as the base. Pen and funnel are black with gold accents. Pen has black ink. Replacement pens are available. Puck is officially licensed by the NHL. This is a real hockey puck. This brings an authentic look to the pen holder. Makes a unique and wonderful gift for hockey fans. Look for the EBINGERS PLACE hologram on this hockey puck gift. This guarantees you are getting an authentic EBINGERS PLACE item. 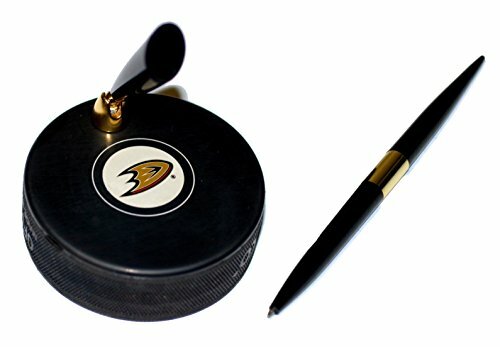 Authentic Licensed Sher-Wood autograph style puck as the base Pen and funnel are black with gold accents Pen has black ink. Replacement pens are available. Puck is officially licensed by the NHL Look for the EBINGERS PLACE hologram on this hockey puck gift. This guarantees you are getting an authentic EBINGERS PLACE item.